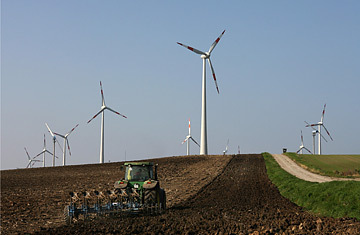 Wind turbines in Dardesheim, eastern Germany. Clustered along the banks of the River Spree in central Berlin, Germany's parliament buildings are designed to make the most of natural light and the flow of air. Electricity and heat are provided by biofuel generators in the basement. The excess heat is then stored in great underground chasms to warm the buildings during winter  when cold from the outdoors is stored underground to cool the buildings again in summer. Even the Reichstag, originally built in the 19th century, now gets 60% of its power from renewable energy. So when lawmakers surveyed their environmental performance last month, you might have expected some self-congratulatory pats on the back. Their ruling? Not good enough. By the end of 2008, if all goes to plan, the Reichstag will run entirely on renewables. It's a telling story. Between 1990 and 2005, Germany's total greenhouse-gas emissions declined 18%; in the same period, those of the U.S. went up 16%. But Germany's impressive performance has been less about innovation than about implementation. The government has left little to chance. An eco-tax on fuel discourages petroleum use. Laws push waste reduction and recycling; producers must pay to deal with packaging they create. Subsidies encourage people to retrofit their homes with solar panels. It may seem glib to resort to national stereotype, but the Germans have done well by being, well, efficient  and that means many of their gains may be replicable. Like the U.S., Germany is a major industrial nation where viable environmental policy must work with business interests. And like the U.S., Germany has a political system in which state and local governments operate semi-autonomously within a federal structure, allowing plenty of room for policy experimentation. So what can Americans learn from Europe's most populous nation? On a blustery day near the small Bavarian city of Schwandorf, white tarps are ruffling in the wind over tons of decaying vegetation, tight-packed and with the consistency of crumbly earth. The site smells like a farmyard. In fact, it's the headquarters of Schmack Biogas, a firm founded by farmer Ulrich Schmack and two of his brothers to make fuel from their waste, and now the largest biogas plant in Germany. The stored vegetation  a feedstock mixture of grass, corn, green rye and the odd potato  will be fed through two giant indoor digesters, where it's churned into a green-brown goop and fermented to produce methane. The company then takes the gas, purifies it a few meters away, and pumps it into Germany's natural-gas grid. This is the beauty of Germany's Erneuerbare-Energien-Gesetz (EEG), the Renewable Energy Sources law or "feed-in law"  the centerpiece of the nation's climate-change program. Without prescribing any specific action, the law subsidizes citizens who produce their own energy from renewable sources, and allows them to sell surplus back to the grid. The subsidies have meant that the production of renewable energy has been ramped up fast. The Environment Ministry estimates more than 14% of the country's electricity now comes from renewable sources. That's more than double the proportion in 2000, the year that a federal "Red-Green" government  a coalition of Social Democrats and Greens  introduced the EEG. Today the law has support from all of Germany's major political parties. "It's the most successful tool. It's the cheapest way of phasing in renewables," says Sven Teske, renewable-energy director for Greenpeace International.